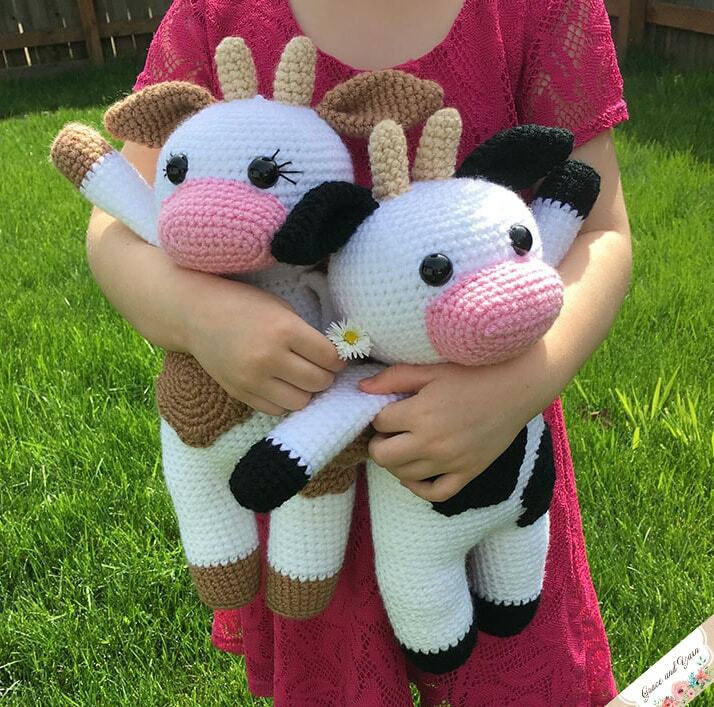 Cows are one of my daughter's favorite animals, they have officially decided that they will be farmers when they grow up! While we don't have room in our back yard for a real one I knew they would enjoy a plushie friend in the meantime. These cows are slightly larger than most of my patterns but still work up fairly quickly at 13 inches tall. The legs and body are made as one piece with the head sewn on separately. The neck has a nice proportion to keep it sturdy for hours of play. And those spots! They may just be my favorite details along with those cute snouts! Since writing this pattern I have added a duck pattern to join them on the farm. 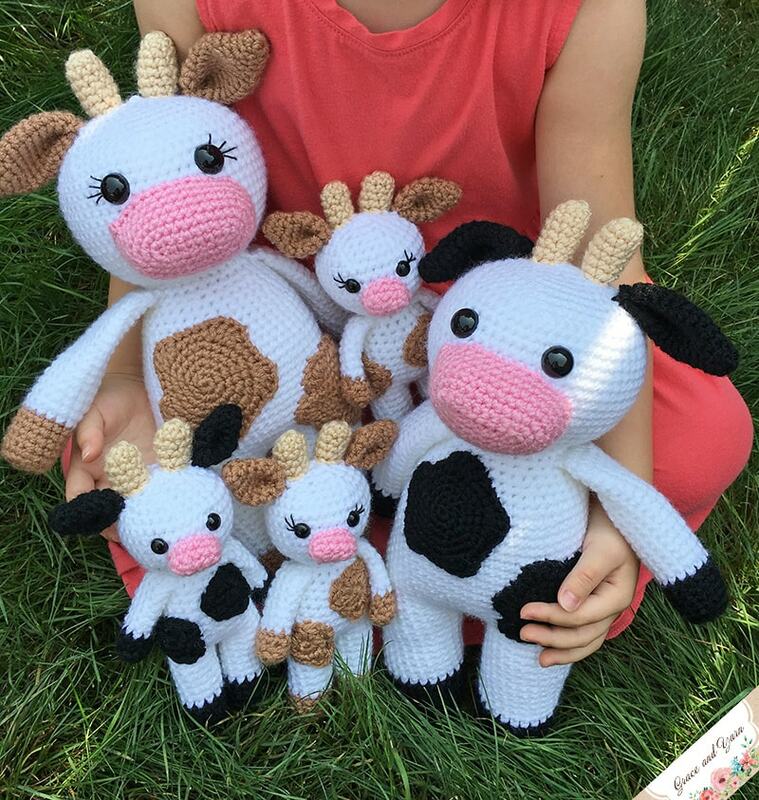 Also added are a mini cow pattern (so you can make your own family) and a mini pig pattern! 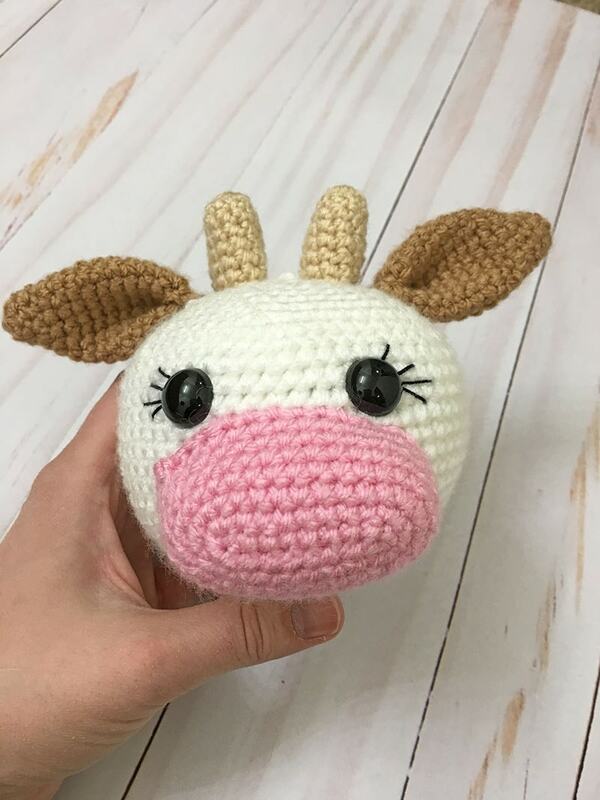 I have loved seeing all of your cows in the Grace and Yarn Crochet Group on Facebook, all the different colors and variations are so cute! I'd love to know what other farm animals you would like to see? Feel free to leave a comment in the group or message below! PIN this pattern to your crochet board here! Grab the ad-free PDF version in my Etsy or Ravelry shop! You can also find a discounted bundle here for both sizes! Don't want to miss any new patterns? Sign up for my newsletter and I'll keep you updated on new patterns, tutorials and giveaways happening here on the blog! 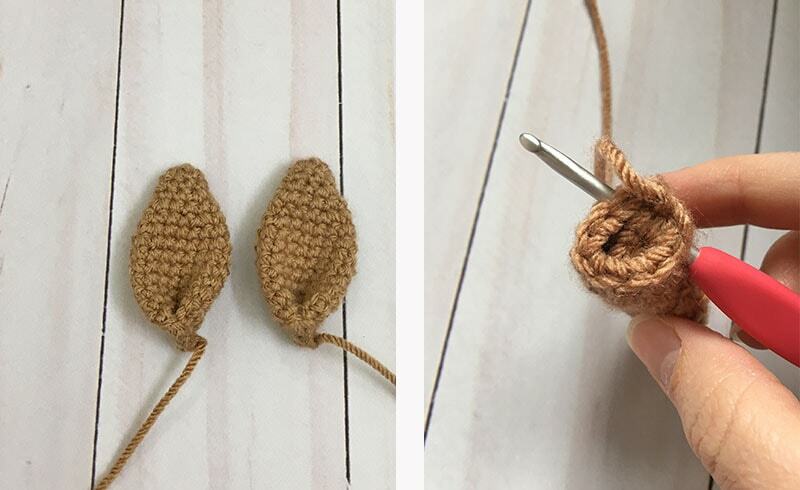 If you're new to amigurumi be sure to check out the Tips to Learning Amigurumi page! It's packed full of mini tutorials and helpful photos to cover all the basics! 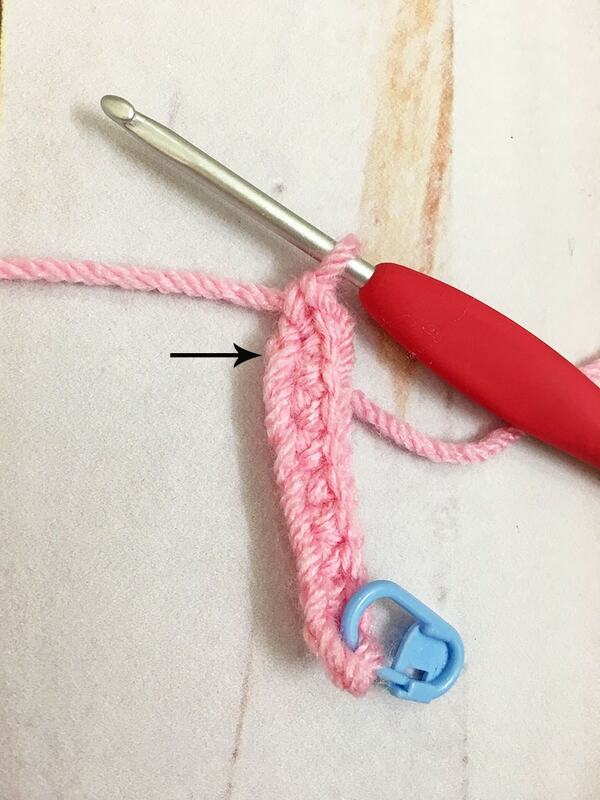 For this pattern I used plastic safety eyes, if you don't have these on hand or prefer crocheted eyes for little ones I recommend this alternative here! Fasten off on the first leg only. When you finish the 2nd leg proceed to round 22 to join the legs. Here is where we will attach the safety eyes. Place them 6 stitches apart between rounds 17-19. If you would like to add eyelashes I recommend having them in place before securing the backs of your eyes. This piece is worked crocheting on both sides of a foundation chain to create an oval shape. You will want to keep your chain fairly tight to help avoid the look of 'holes'. - Sew the snout centered between the eyes stuffing as you go. - Next, sew the ears onto the head at the 6th round on each side. - Lastly, sew the horns evenly placed between the ears. - Sew the head onto the body, making sure to have the facial features centered. Add extra stuffing as you go to keep it firm and less wobbly. - Next, sew the arms onto the body centered with the head at round 46. - Lastly, sew a large and medium spot onto the front and back of the body. You're sweet cow is now complete! I hope you have enjoyed making this pattern, thanks so much for stopping by! Thank you, my grandsons will love them. Hartelijke dank voor het snoezige patroontje. How generous of you to share all this work with us. The cow is too cute for words. Thank you! Thank you so much for he pattern, I'm learning to read patterns and yours was really easy. 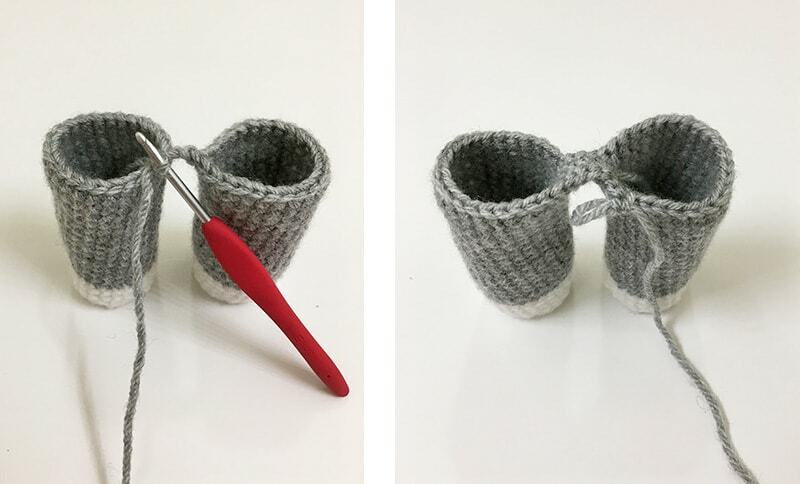 Hi Stephanie, thank you for sharing this cute pattern! Could you maybe help me with something? I don't understand how I can attach the legs together and end up with 54 stiches, do you perhaps have a video for this? Hi! Each leg is 24 stitches and we will do a chain 3 to connect them. As we work around each leg we end up crocheting into both sides of the chain 3 and this gives us a total of 6 more stitches added to the total of legs to end up with 54. I don’t have any videos yet but The Friendly Red Fox has a wonderful video about joining legs in the same method, I hope this helps! Hola Stephanie te agradezco un montón, el que hayas compartido tu patrón es muy hermoso. Y trataré de realizarlo. Pero me gustaría saber cómo realizar en un tamaño más grande. Gracias. 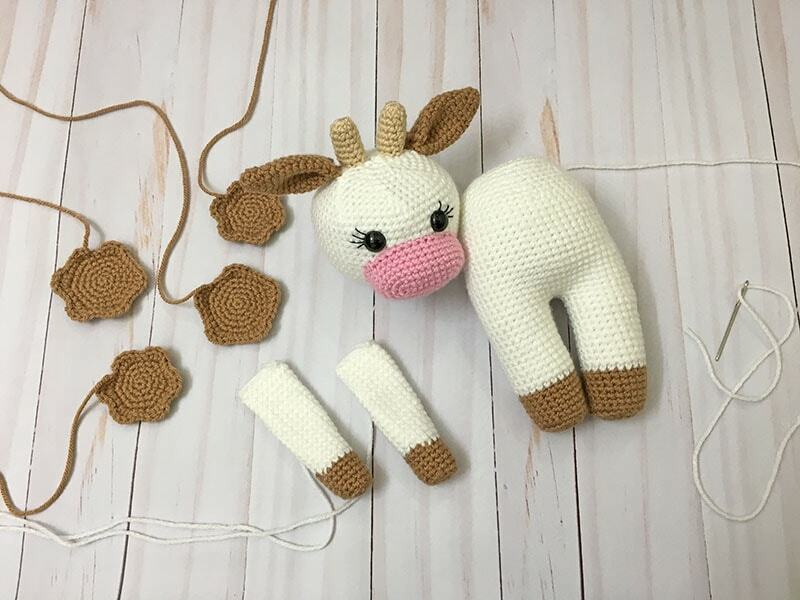 Would you be able to make a doll using this pattern without making the horns, ears etc.? On the large spots, I get 30 stitches on Round 5, but only get 40 stitches on Round 6? I'm guessing this is right...right? I just adore cows and your pattern is totally awesome! I'm not so good at crochet so I'll see if my Mum is willing to give it go for me. Thanks for sharing! Hi, I just LOVE this pattern, and I can't wait to make it! Would it be ok if I featured your pattern on my blog? Una Pregunta, la parte de arriba del cuerpo termina con 30 puntos y hay que unirlo a la cabeza que termina con 6 puntos? Con tanta diferencia de puntos como se une la cabeza al cuerpo? Hi Isabella, at this time the pattern is only available in English. My head just blew up with how adorable they are! I can't wait to get started, thank you for posting these. You're welcome, I hope you have fun making them! !